This column was written by MarketWatch's Jon Friedman. The most telling aspect of President George W. Bush's treatment of the media is that his incoming successor, Barack Obama, has already eclipsed the nation's 43rd chief executive in relations with journalists. Obama has (smartly) reached across the media divide to listen to conservative journalists and show them some measure of respect. It's hard to imagine that Obama would truly embrace the views of Bill Kristol, the journalist who was an early champion of Sarah Palin and has espoused classic right-wing views. But Obama is, at least, giving an audience to his critics, much as President John Kennedy once did. At the very least, Obama has a shot at schmoozing his traditional foes among reporters, columnists, editors and bloggers. With less noise from the opposition, Obama could have the comfort of taking office in more media-friendly confines. Sure, most journalists are naturally lefties who gravitate more to the views of Obama than Bush. But as Bill and Hillary Clinton rudely found out, your critics relish taking shots at the president. Perhaps it's Obama's twist on the vintage management advice mentioned in "The Godfather" film series: "Keep your friends close -- and your enemies closer." Unfortunately, Bush never grasped that idea. Last week, Bush continued to make stops on his well-scripted media farewell tour. While news networks doggedly trumpeted each interview with Bush as some sort of an "exclusive," as if Bush was inclined to dish any dirt or offer shocking disclosures about his eight years in the White House. But really, the conversations proved to be the same mindless chatter in which Bush and the media have engaged. Reporters are as much to blame for the feeble interviews and press conferences -- however few -- that Bush presided over. Some journalists were too intimidated or star-struck by the all-powerful Bush-Rove-Cheney axis to probe deeply in appearances with the president. Maybe they were finally too disgusted with Bush's smirks and lame one-liners to come back at the sitting president with tough questions, ranging from Iraq to Hurricane Katrina to Afghanistan to Osama bin Laden to the economy. George W. Bush has embarked on a media-driven farewell tour worthy of a rock star. He is appearing on television everywhere and cloaking his appearances in a kind of wistful, nostalgic look at his eight years in the White House. 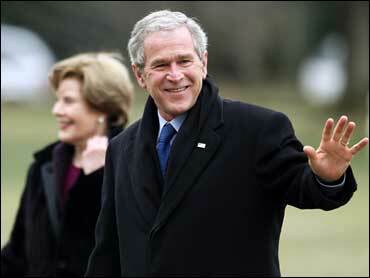 My question: Why is Bush saying hello to the media when it's time to say good-bye? As the media has noted, Obama is already as much of a "rock star" -- even a pop culture icon -- as the leader of the Free World in the eyes of journalists. Obama has managed to maintain the public's high degree of fascination that propelled him past both Sen. Hillary Clinton and Sen. John McCain to the White House. For better or worse, the cooperation of a rabid media corps helped him considerably. How long can Obama hope to have reporters in his pocket? As I've glumly noted in this space before, what goes up, must come down -- including, inevitably, the Obama press-relations balloon. Obama has a tendency to bristle at questions that he regards as intrusive or unfair or ill-informed. He must try hard to temper this destructive instinct or else he risks winding up cast as the enemy, much as reporters came to do with Bush. Let's all wish the incoming president more success than his predecessor at rallying the United States. In this case, it doesn't matter if you are a liberal or a conservative, someone who religiously watches the left-leaning MSNBC, or the right-tilting Fox News Channel (which, like MarketWatch, the publisher of this column, is owned by News Corp. It doesn't matter if you're a skeptical, if not cynical, media columnist. It matters that the American media should give Obama the benefit of the doubt -- for now. MEDIA WEB QUESTION OF THE DAY: Who will prove to be a more media-friendly president, George W. Bush or Barack Obama? Join the online community of Media Web readers by commenting directly on the MarketWatch site.